My friend’s daughter is expecting twins and wants to wait until the birth to learn the gender of her babies. 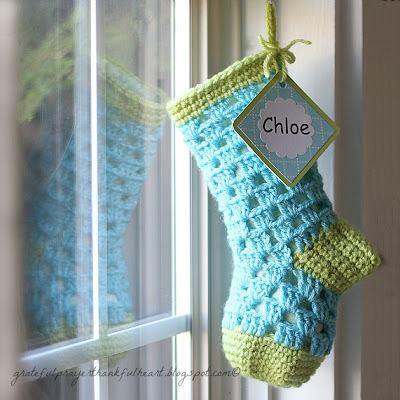 So, I tried to be creative in choosing a gift for her baby shower, crocheting complimentary colored stockings for the babies 1st Christmas using an easy crochet stocking pattern. I know from personal experience the excitement of a twin birth and the unique blessing of parenting and being privy to that special bond twins share. Seeing the sameness and the differences in each little person all the way through their adult life, are filled with moments that warm my heart. 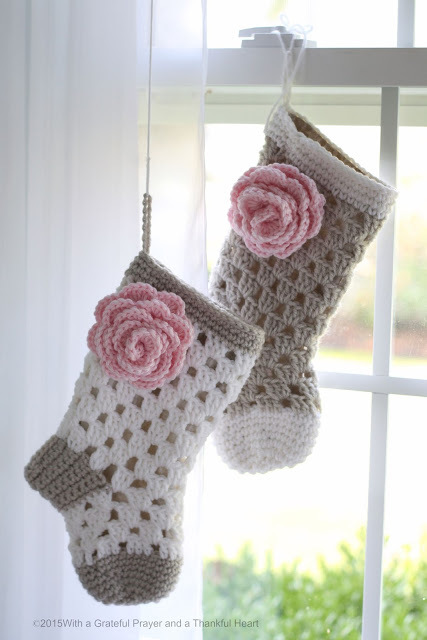 I decided to make a set of Christmas stockings like the one I made for our granddaughter, Chloe when she was born. But this time I used soft neutral colors that works for boy or girl. 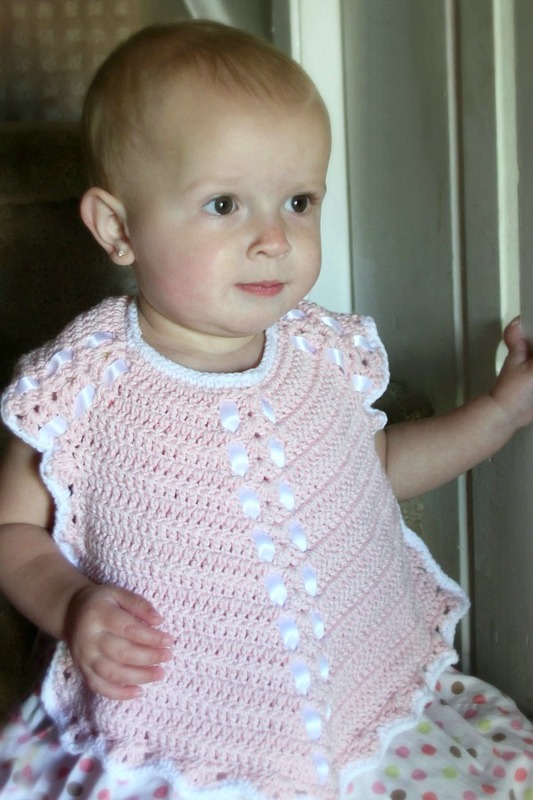 If one or both babies should be little girls, I added crocheted rosettes that can be tied on if she wants to embellish the stockings. about half a skein of each color to make both stockings. Note: When joining colors, work to last 2 loops on hook of first color. Draw new color through last 2 loops and proceed. Beg at toe with Color 2, ch 3. Join with sl st into first ch to form ring. 1st rnd: Ch 1. 8 sc in ring. Join with sl st to first sc. 3rd rnd: Ch 1. 2 sc in each sc around. Join with sl st to first sc. 32 sc. 4th to 8th rnds: Ch 1. 1 sc in each sc around. Join with sl st to first sc. Join Color 1 at end of 8th rnd. 9th rnd: With Color 1, ch 3 (counts as dc). 1 dc in each of next 2 sc. Ch 1. Skip next sc. (1 dc in each of next 3 sc. Ch 1. skip next sc) 7 times. Join with sl st to top of ch 3. 10th rnd: Sl st to first ch-1 sp. Ch 3 (counts as dc). 2 dc in same sp as last sl st. Ch 1. Skip next 3 dc. (3 dc in next ch-1 sp. Ch 1. Skip next 3 dc) 7 times. Join with sl st to top of ch 3. Rep 10th rnd for 2 more rows for a total of 4 rows. Join Color 2 at end of last rnd. 1st row: (right side). With Color 2, ch 1. 1 sc in each of next 16 sts. (this includes the ch 1 space of previous rnd) Turn. Leave remaining stitches unworked. 2nd row: Ch 1. 1 sc in each sc to end of row. Turn. 16 sc. Rep 2nd row for 8 more rows, ending on a wrong-side row. 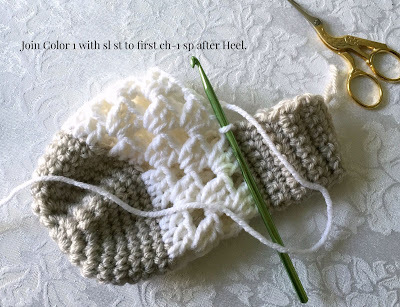 With right-sides together, fold heel in half. Working through both thicknesses, work 1 row of sc to join 2 sides tog. Fasten off. Join Color 1 with sl st to first ch-1 sp after Heel. 1st rnd: Ch 3 (counts as dc). 2 dc in same sp as last sl st. Ch 1. Skip next 3 dc. (3 dc in next ch-1 sp. Ch 1. Skip next 3 dc) 3 times. Work (3 dc. Ch 1. Skip next st) 5 times evenly along heel. Join with sl st to top of ch 3. 10 groups of 3-dc. 2nd rnd: Sl st to first ch-1 sp. Ch 3 (counts as dc). 2 dc in same sp as last sl st. Ch 1. Skip next 3 dc. (3 dc in next ch-1 sp. Ch 1. Skip next 3 dc) around for 10 groups of 3-dc. Join with sl st to top of ch 3. Rep 2nd rnd for 8 more rnds. Join Color 2 at end of last rnd. Next 2 rnds: Ch 1. 1 sc in each sc around. Join with sl st to first st.last rnd: ch 1; slips st in each sc around. Fasten off; knot all ends. Hanging Loop: Join Color 2 with sl st at center back of Stocking at top edge. Ch 15. Sl st in same sp as last sl st. Fasten off. 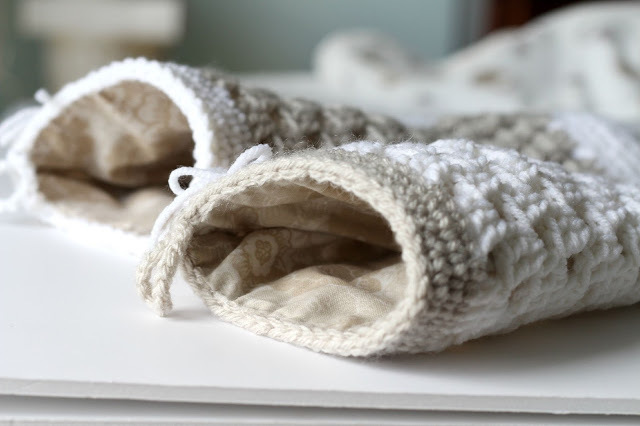 Line stockings with fabric to keep items from poking through the holes. 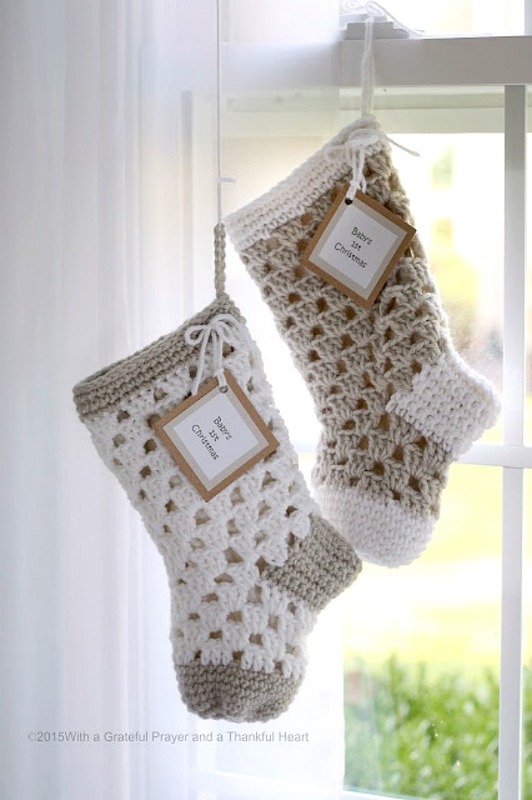 Make a pattern by placing the finished stocking on a piece of paper. Trace around stocking adding a 3/4-inch seam allowance. Cut out pattern and pin onto fabric with rights sides facing. Cut out; sew. Do not turn right-side out. Slide lining into the crocheted stocking, aligning sides. Turn top edge of fabric under and using a needle and matching thread, hand stitch the lining to the stocking along the top edge. The rose flower shown in above photo was made following the ch 53. Row 1 Dc in 5th ch from hook – first V-stitch made, *ch 1, skip 1, (dc-ch-dc) in next ch – V-stitch made; repeat from * across; – 7 (16, 25) V-stitches made. Turn. Row 2 Ch 3 – counts as dc, 5 dc first in ch-space, *sc in next ch-1 space, 6 dc in next ch-1 space – shell st made; repeat from *, ending 6 dc in last ch-1 space – 7 (16, 25) shells. Fasten off, leaving long tail for anchoring Rosette. Thread needle with tail and weave to base of last st. Starting at that end, roll first shell tightly to form center bud; anchor at base of shell with 2 sts. Roll remaining strip to form Rosette, then secure by stitching in and out through layers of foundation ch at bottom of Rosette. At end of Row 2, work last dc of last shell until 2 loops remain on hook, drop main color, finish st with new color, ch 1, turn. Row 3 Sc in each st across. Fasten off. I slightly altered the pattern I used to make this sweet Christmas stocking for Chloe. These are way too cute!! Would you allow me to include them in a pattern roundup I’m putting together on my blog? I would love to include a photo and would, of course, link back to your website. I have a question? The start of rnd 4 will it be a total of 8 sets of dc? I love these! It's a great shower gift as most people don't think of the first Christmas unless the baby is due during the holidays. Adding the option for the rosettes was a good idea. I always enjoy seeing what you've made – it inspires me. Oh those are sweet and classy color combos! LOVE LOVE LOVE these! From the colors, styles, and soft all around look, they are perfect. What a nice gift! 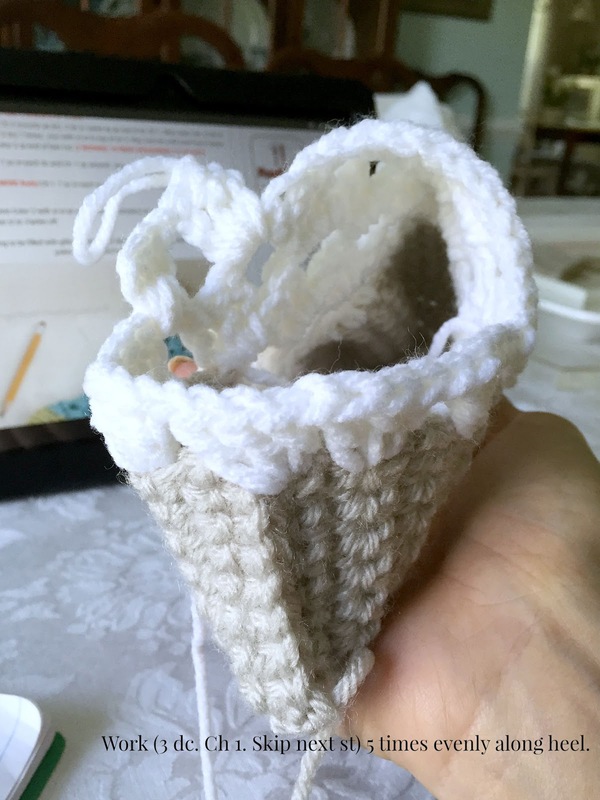 I always want to learn to crochet when I visit here! Enjoy your week! Delightful! I'll file the pattern to use at a later time. Thank you for sharing. They are simply adorable!